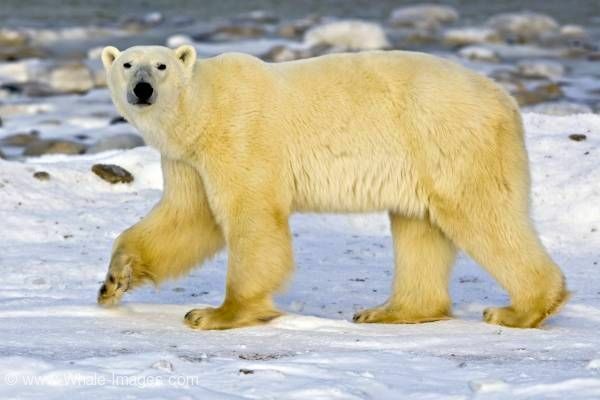 The polar bear is probably the most known arctic animal and is often used as a symbol for global warming. The most symbolic arctic animal is the polar bear, mostly used today as "the symbol" for global warming and endangered animals. I photographed this cute polar bear walking along the Hudson Bay shoreline in northern Manitoba, Canada. In this cute pose the polar bear almost looks like a teddy bear with its cute ears, but in this moment when I photographed this beautiful arctic animal it probably thought more about eating me and not really about playing with me. The polar bear is a top predator and is extreme dangerous to people and never should be trusted, no matter how cute they look. Cute Polar Bear, Ursus maritimus, on the icy fringes of Hudson Bay, Churchill, Manitoba, Canada. Photo of a cute polar bear, an arctic animal, walking along the Hudson Bay shoreline, Manitoba.